If there's one thing New Yorkers need, it's dependable transportation. Between gridlock Brooklyn traffic, the challenging Bronx roads, and the weather, people are understandably nervous about trusting a used car to hold up to the daily grind. So, if used cars seem risky, why not lease a car? You get the safety of the latest technology, the dependability backed by a new car warranty, and the latest vehicle security so you won't find yourself looking at an empty parking space in upper Manhattan where your car used to be. These are all pretty good reasons to lease a car. Sure. Sounds great, you think, but can you lease a car with bad credit? It's absolutely possible! While you won't necessarily be able to lease a car in Long Island with that 0% finance offer you've seen splashed on TV screens for "well qualified lessees," having a poor credit rating doesn't mean you should be shown the door either. There are plenty of auto dealers across all five boroughs that lease through special finance companies. This means that instead of getting your financing handled through an automotive financing arm like Ford, GM, or Chrysler, which all require a higher level of credit, these dealers work with lenders that specialize in subprime finance to help families with more troubled credit. Of course, there is an alternative to get those zero money down auto lease deals even if you do have bad credit, and that is to consider finding a cosigner, usually a family member or close friend. A cosigner is someone with a good credit score who can add his or her prime credit to your lease. However, a cosigner should think long and hard before agreeing to sign anything, because once their name is on the lease they are as liable as you are for making payments according to the terms of the lease. There are some definite advantages to leasing a car, but like most things in life there are also a few disadvantages. Most of the advantages revolve around being able to drive a new car, but if the advantages don't outweigh the drawbacks, maybe you should consider a bad credit auto loan instead. It's New - A brand new car means you aren't buying someone else's mistake. Reliability - You're getting a car with almost no miles, brand new tires, and the latest safety technology. New Car Warranty - If it does break down on the way back from North Jersey, you're covered. Better Credit - Pay those bills on time, and your credit will improve. 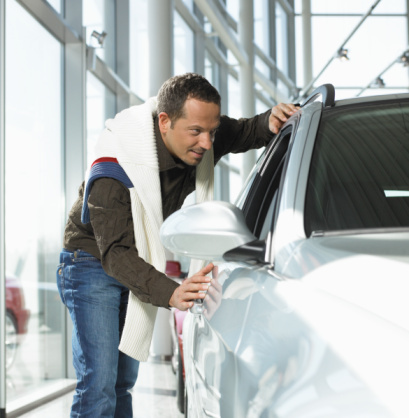 Limited Miles - Good or bad credit, you'll still have to deal with limited miles. Higher Cost - Subprime leasing companies charge higher fees to cover the added risk. Money Down - Subprime car leases are all going to require money down. Added Hassle - Bi-weekly or even weekly payments are not unheard of. Like traditional leasing, bad credit auto leasing isn't for everyone. This is especially true if your daily commute takes you long distances across the downstate area and you would run the risk of having to pay high fees for extra miles used. But if you're ready to re-establish your credit, and you feel a new car lease is the way to go, we are ready to help. To get started begin by filling out our loan request form by clicking on the banner below.